2018 Cherry Creek National Hare & Hound Results – Dust is an unfortunate reality in desert racing and when there’s lots of it, going fast is next to impossible. But that doesn’t seem to apply to Taylor Robert. The FMF KTM Factory Off-road Racing Team star somehow rebounded from a horrible start to win the Sugarloafers Motorcycle Club’s 58th Cherry Creek Hare & Hound, round five of the Kenda/SRT AMA Hare & Hound National Championship Series, Presented by FMF. 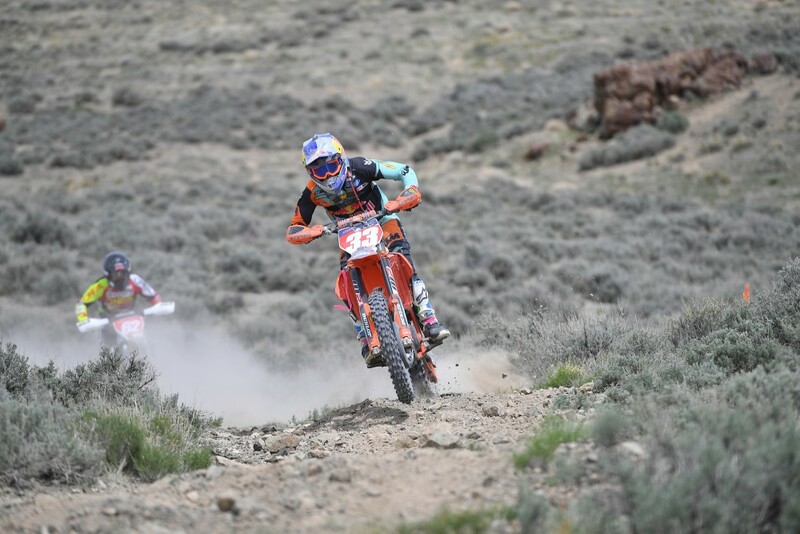 Despite rain in the days leading up to the race at the Little Sahara Off-Highway Vehicle Area, conditions were polar opposites of round four held here two weeks ago a few miles farther east. Circuit Honda-mounted Kendall Norman led the pack through the chicanes before getting onto the trail for the first loop of 40 miles. Robert, on the other hand, found himself buried in the dust when his Red Bull/Motorex/Troy Lee Designs 450 XC-F balked when the banner dropped. Though unaware of Robert’s plight, Norman wasn’t waiting around to find out and quickly went into the lead on his Saunders Family/Renthal/Alpinestars CRF450X despite not being 100 percent after crashing while practicing the week before and injuring a thumb, making it extremely hard to hold on. Somehow, Robert had punched through the dust and put himself into second behind the 2010 series champ and current points leader, though he was a minute and 16 seconds behind Norman at the end of the first loop. But Robert kept pushing and eventually caught sight of Norman’s dust, reeling him in and then applying pressure until the Honda rider made a couple mistakes and went down twice. That was all Robert needed and he completed the 40-mile second loop the clear-cut winner, completing the race in two hours, 33 minutes and 30 seconds. Burson rewarded himself with second—his third consecutive podium finish—some 3:23 behind Robert while Norman made his fifth podium in third place. Norman remains atop the points with 126, Burson making up a little ground and sitting second at 107 with Robert third at 90 and closing. Smith held on to take fourth—tying his career best to date—followed by FMF Pro 250 winner Josh Knight on his Mom and Dad/ADS Motorsports/Fly Racing KTM 250 XC. Remarkably, the Utah native ran out of fuel with about a couple hundred yards to go and had to push it through the sage and sand to preserve his win. “It was one of the hardest things I’ve done, pushing it after that many miles [of racing],” he said. Second FMF Pro 250 and sixth overall went to Economy Floor/Woolslayer Racing’s Daemon Woolslayer, a couple minutes ahead of SRT Husqvarna’s Clayton Gerstner who was another rider to had to mount a fierce charge through the dust after a poor start. Beta’s Chance Fullerton was third FMF Pro 250 and eighth overall to preserve his class points lead over Woolslayer, 136-115. SRT Husqvarna’s Morgan Crawford and Mark Tichenor CPA Yamaha rider Kyle Tichenor rounded out the top 10 overall. Brandy Richards won Women A for the third consecutive round aboard her Bell Helmets KTM ahead of Rachel Stout and Britney Gallegos, who complained of numerous spills. Gallegos saw her class points lead cut to one over Stout, 97-96, while third-place Richards closes in with 90. Click here for more hare and hound news and results.